Description: "The tropics has [sic] one of the most interesting bird populations in the world. Tropical birds rely on the brilliance of their plumage to attract attention and the illustrations in the book show all the richness and diversity of their form and colouration. [The book] looks at a wide cross-section of birds from various habitats – jungle, grassland, wetland, mountain and town are all included and in this way the incredible variety in type and behaviour of tropical birds is illuminated. The author includes interesting information on the way in which birds have adapted to co-existing with man and animals competing for the same habitat and the important measures being taken to conserve endangered species, threatened by man's exploitation and interference with his environment. 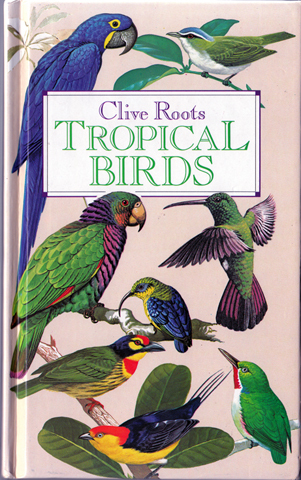 Full of valuable and concise information this book is a must for any bird enthusiast and illustrates the splendour of tropical bird life." Exquisite full colour illustrations throughout. Glazed pictorial boards are in excellent overall condition, with only negligible bumping to the lower corners and spine ends. Internally, the book is effectively as new. Pages are very tightly bound. Measures 18.5 cm × 11.5 cm (7.4″ × 4.5″). 12mo. 159 pp.